It's here! The week one designers reveal for All Stars! We are loving the art inspired looks that have been uploaded to the linky party and those submitted by the designers are amazing as well. Now, your job is to scroll through all of the beautiful photography, read about the inspirations, then vote for your favorite! You can find where to vote over there on the sidebar so get going! There's so much to see! I used Aztec art, specifically, the Aztec calendar as my inspiration for this totally BOY look! The staple piece is the hand screenprinted shorts, with an all-over geometric pattern. I printed the fabric before sewing them together and even printed enough to line the hood. The shorts have front and back pockets. The front pockets have mint green trim and the back pockets are angled for extra geometric flair. The shorts have a little elastic in the back and a 2 button closure in the front. To achieve the mint green color on the tshirt, shorts pocket binding and vest lining, I dyed white fabric and bias tape. I made sure each piece of the outfit had a little mint green. 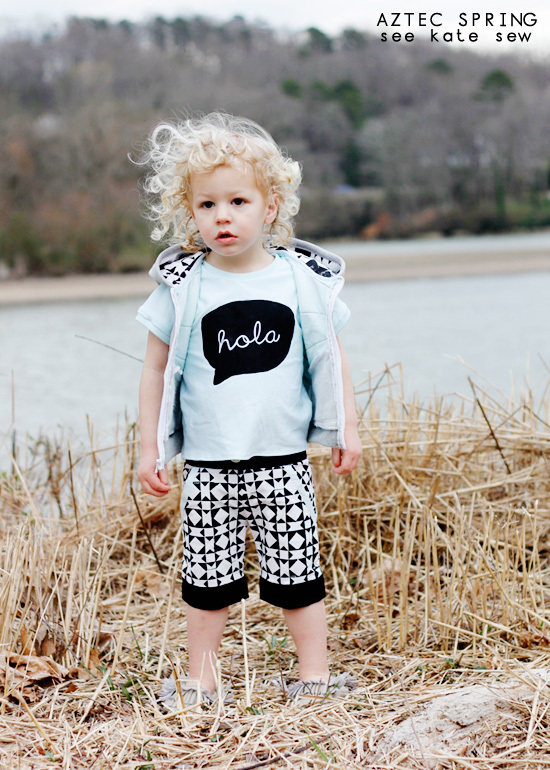 The graphic tee is printed with a speech bubble and the word "hola" which is hello in Spanish. The Aztecs spoke a different language, but since Spanish is the language now where the Aztecs lived, it would be a modern take. The tee has a ribbed neckline and armholes. The hooded vest is my favorite part. I topstitched a chevron pattern to go with the geometric feel of the outfit. The hood is lined with more silkscreened print and there are open welt pockets on the front. The bottom is ribbed and the armholes are faced! I also made faux suede moccasins and a feather headdress to complete the aztec look. 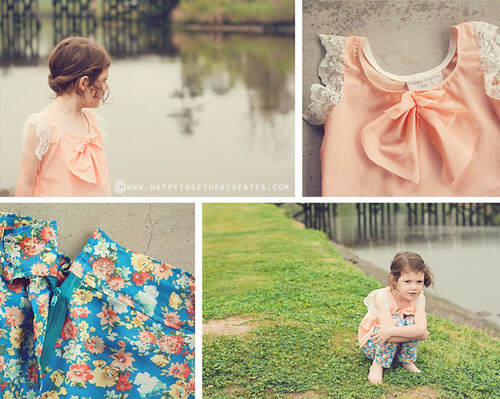 Come by see kate sew for more details and a whole lot more pictures! When I first saw the challenge for week one being Art Inspired... I was stumped... So I googled Art... The very first piece that came up flooded me with memories... You see ever since I was a wee little one I have been drawn to Modern Art... why? Because I would see it and say "I can do that" Not in a how is this art kind of way but I felt inspired like I could actually do that. I can't draw a bowl of fruit, or a person, but I can draw some squares and spill some paint. 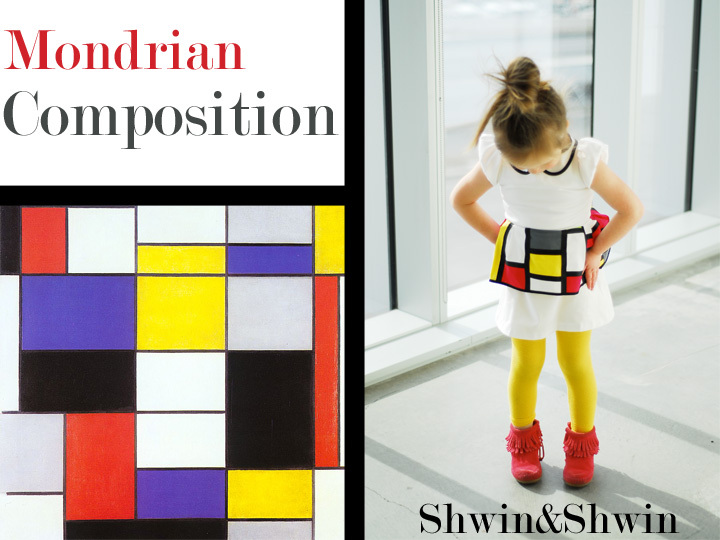 I have always been particularly drawn to Mondrian Composition. 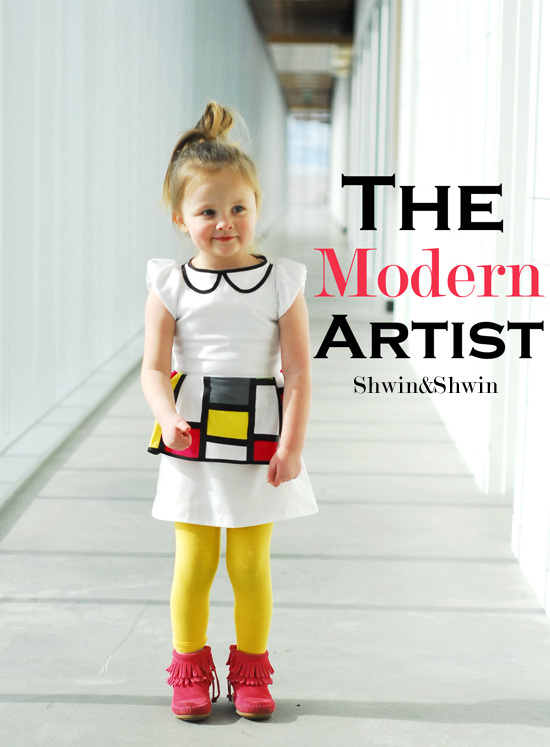 It has the cool clean modern feel that I am naturally drawn to, and it inspires me to create, because "I can do that!" Inspired by the art I made a pieced peplum ruffle, and placed it on a "blank canvas" white dress. 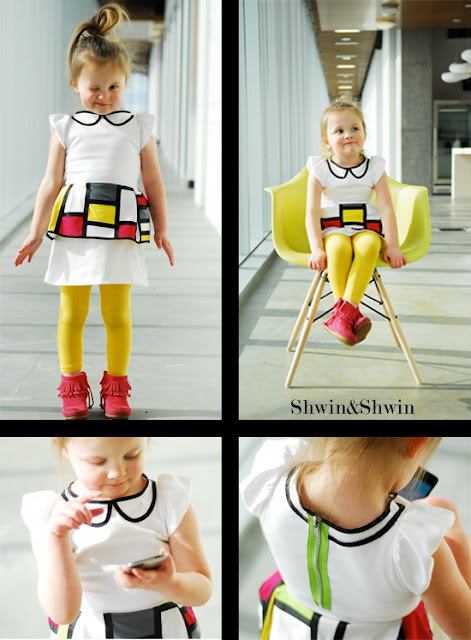 I wanted the dress to have an art feel so I made a collar outline so it would look drawn on, and I used fun and bright colors to pop and be kid friendly. I also made a pair of yellow leggings to wear underneath. Art-Inspired week-this theme was fascinating and really exciting for me. I love art-especially the Impressionist era artwork. I got to see a lot of them in the flesh (er....canvas?...) when I went to Paris as a teen. Hanging out at the Louvre and Musée d'Orsay was the highlight of that trip, for sure. I had a hard time choosing an art piece-I seriously had rough outfit sketches and plans for about 6 different paintings, but finally chose this one by Monet. The colors were amazing and I loved how all the women in the picture seemed like they were having a grand ol' time. It reminded me of me and my three sisters. So from the painting, I picked my color palette and fabrics out-a dusty gold, bright red, emerald green, and soft white and navy polka dot. I started with the top-a quirky little peplum top with a narrow peter pan collar, exposed navy zipper in the back, and cap sleeves. (sleeves inspired by Rae's Geranium dress, and peplum inspired by Dana's circle skirt) The cropped leggings were made from double layered soft gold jersey, sewn and fitted and re-sewn to my little Sadie til they fit perfectly! I hand stitched some lace bows right above the hem for a vintage touch. 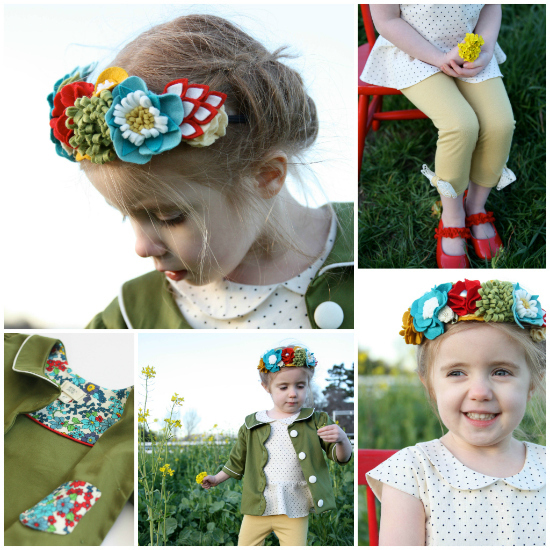 The emerald green scalloped jacket is fully lined with a secret pocket inside! The special floral fabric used in that pocket is also used on the lining of the jacket for a fun little accent. 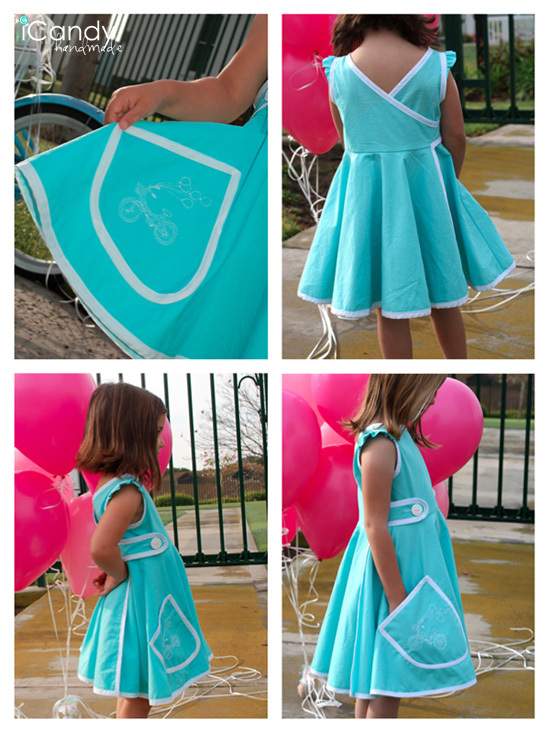 It also has pockets in the side seams for her hands, trinkets, and candy, of course. The front of the jacket has a row of scallops with an off white covered button framed in each to keep it closed. 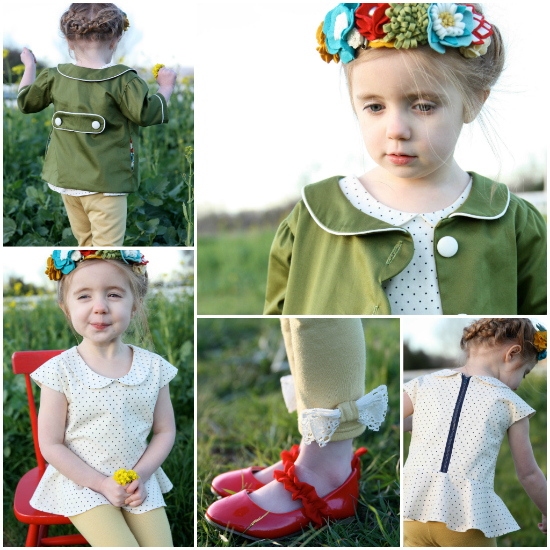 The peter pan collar and sleeves are trimmed in a bit of piping to make them pop! I also added a little button tab on the back of the jacket for visual interest-I decided to sew it on after the jacket was sewn together-so it was quite the job hand sewing it to the outside of the jacket only! The headband (inspired by the bouquet one of the ladies is holding) was a labor of love-about 10 or so hand made felt flowers that I spent hours arranging "just so"! Come see more pictures at my blog, Craftiness is not Optional! 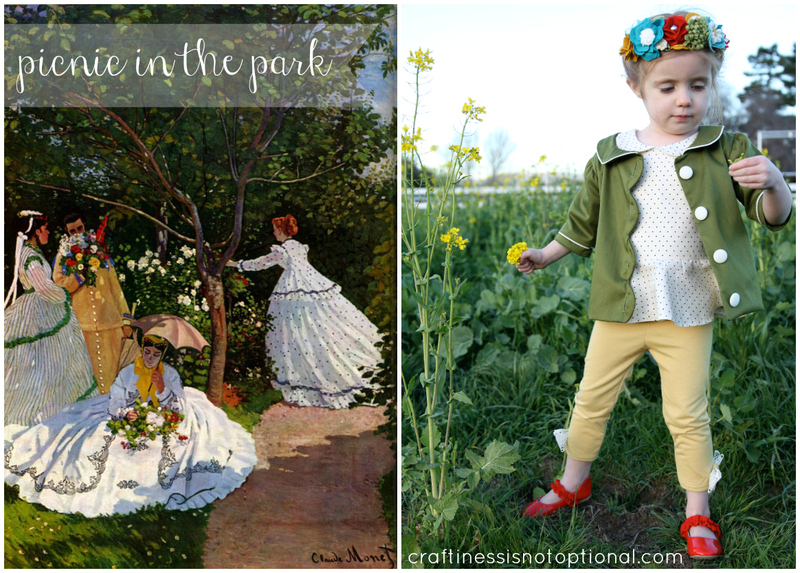 This week's outfit for my daughter was inspired by Claude Monet. I love flowers and nature in general, so naturally I would be attracted to his artwork. Since wild and flowerful pants are also in, I took this as an opportunity to make some. I found a lovely fabric that was bright and "in bloom" with flowers. It was my very first time creating pants with a front zipper. I drafted the pattern from a pair of pants my daughter had already. I created a simple top to go with the more over the top print on the pants. Just a simple tank top with some fancy details. 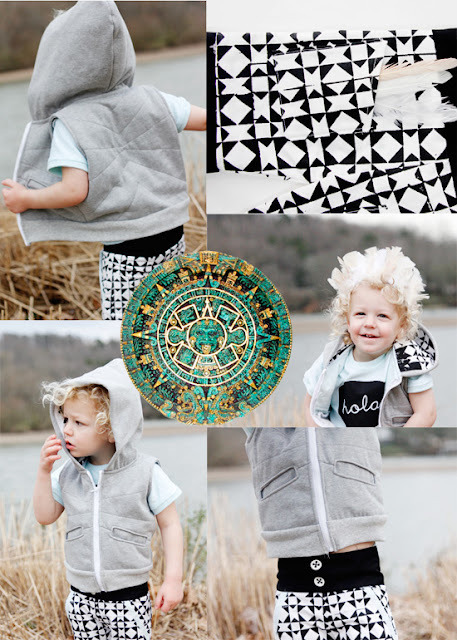 It's a perfect little outfit for my little explorer to play around in. You can find out more about this outfit on my blog. Art. I grew up with an artist father, who worked in art museums my whole life, and who now paints full time. You would think that this would be an easy challenge, right? Ha! I looked up art for hours and nothing struck me as inspirational. By accident, I found this adorable ink drawing on Etsy that both Autie and I fell in love with. Maybe not one of the great masters, but pretty darn cute, right? I would love to frame this and put it in my daughter's room. It makes me happy to look at it. We ended up creating a vintage-style wrap dress for this look. 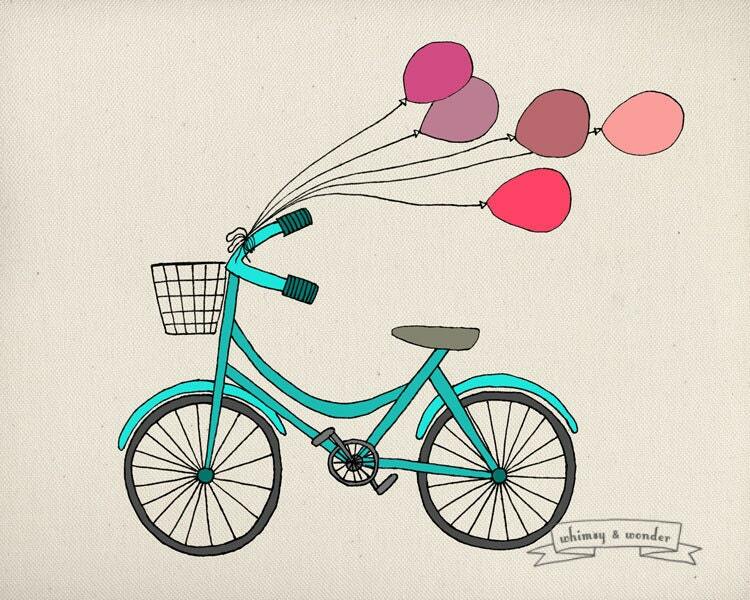 For some reason, bicycles, balloons and cute little turquoise and white dresses go hand in hand. The dresses are made out of kona cotton and miles of white bias tape. If you ever need a lesson in tricky bias tape situations, this dress has it all! Tight curves, inverted corners, and regular corners! I now am quite the bias tape expert :) Autie, the master embroiderer stitched the bicycle design on one pocket. The girls love love love these dresses. They are boat neck, with attached circle skirts so they twirl really well! I also fiddled around with the flutter sleeve so the bias tape could be between the flutter and the bodice, as well as hem the raw edge. Woohoo!! It's here! The first week of All Stars! So, art inspired...it took a few false starts before I settled on my inspirational art piece for this theme. I seriously googled "art inspiration" trying to get ideas at first. But when a friend suggested the artwork of Michelle Armas, I fell in love. For the art-inspired look this week, I chose a Michelle Armas painting called "Zombie Jeeves." The colors, the elegance, the softness, but also the beautiful saturated color just seemed to fall in line with my sewing style. 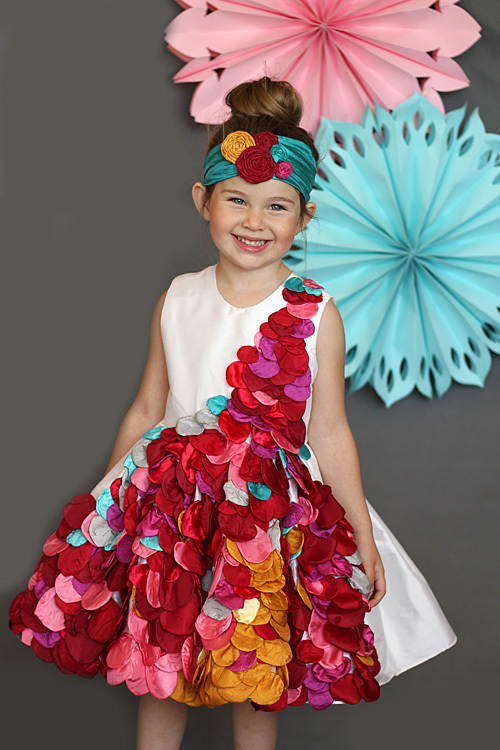 I envisioned an elegant ball gown bursting with color. I created the Petal Splash dress using white silk dupioni for the main dress. The sheen of the silk and the way that it holds its shape provide the perfect silhouette for a ball gown. 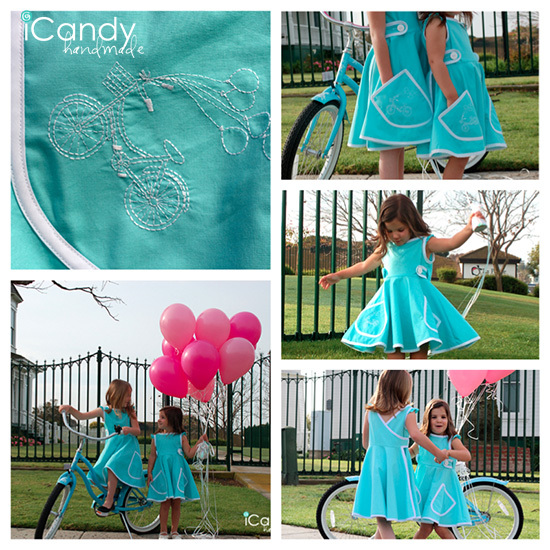 The bodice and skirt are fully lined with a soft cotton sateen. The simple neckline and sleeveless design lends all focus to the spray of color spilling across the full skirt and up over the shoulder. The back of the dress zips closed with an invisible zipper. I tried to mimic the color palette of the artwork using small petals cut from a variety of satins in shades of red, magenta, pink, mustard, grey, and teal. I cut, singed, and stitched 417 petals onto the gown. It's dramatic and full of color and my daughter is In. Love. with this dress. She must have tried it on after each new petal was added. When it came time for pictures, she was all over it. Twirling, bowing, tilting her head, swaying her hips; this is a glamour girl party dress through and through. And once we finished her photo shoot, she asked if she could keep it on forever. Of course! I would love it if you'd hop over to Girl. Inspired. 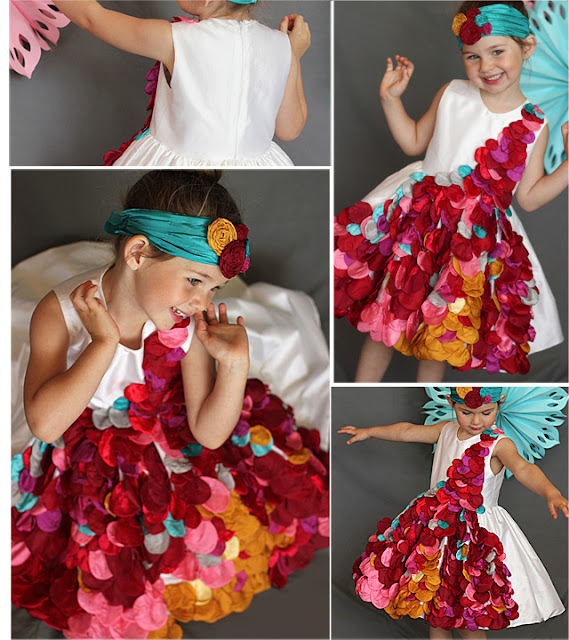 to see more of the Petal Splash Gown! holly majoly - jaw on the floor, so impressed with all the inspiration and the final looks. 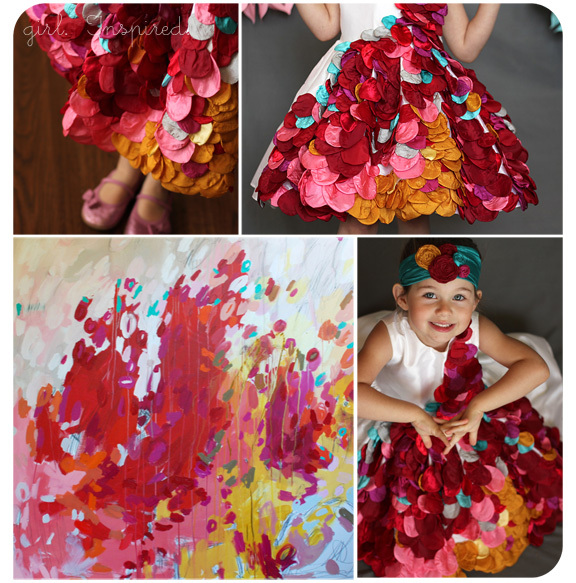 My art inspiration folded into baby girl's Easter Dress - and since it still doesn't have buttons ;op - I'll just save it to share for Spring formal. How is anyone supposed to choose??? I am so glad everyone is sticking around the whole time! PS- Where do we vote for the sew-a-longers? arghhhhhhhh I just voted but I kept changing it before I actually hit the "vote" button... you made it so hard for me to chose a favourite!!! Yessssssssss! Everything I dreamed of and more. You all rocked it! I wish there wasn't even voting, just a series to bask in all your awesomeness for a few weeks. I want to see all the looks for everyone!! Oh wow, all star week, indeed!!! These are so great, I can't wait until I can come back and click through to all of these. Well done ladies! GASP!!! (Can I exhale, yet?) Wow, these designs are amazing! I love all of them. holy cow, how am I supposed to vote?!?! they are all AMAZING! so hard to choose since I follow nearly all these girls blogs! ugh, so tough LOL!!!! wwwwooo!! what amazing art designs!! it's impressive!! great work! These are all so amazing!! So very hard to vote. Fabulous job ladies! HOLY SMOKES! YOU GUYS KILLED IT!!! I AM SO ABSOLUTELY BLOWN AWAY. just wow. You guys did fabulous! I really love them ALL. You guys seriously brought it this week!!! WOwza. I am more than impressed with each one of you. This could have easily been the finale week for any other season. Such amazing quality, creativity... Oh this is sooo good! All-Stars is bringing it! So excited!!! I love each of them. They are so diffrent in style that it makes it hard to vote. Great job ladies and models. Wow. Wow!! They are all gorgeous!! I don't know how to pick. I am so impressed with all your skills and all the interpretations!! Wow! Super impressed with the submissions and now excited to use my favorite works of art as inspiration in my sewing. Just wow! How in the world am I suppose to pick one to vote for when they are all so wonderful? There are some REALLY awesome Projects here.. I can see why this is an ALL STAR series ;) Great Job, Ladies! That was a very difficult choice. Everything is just stunning!! Such a tough choice! I LOVE every single one of them! you have to click over to "view web version" at the very bottom of the page. WOW, before the competition started I was a bit annoyed that no one got votes off...now that I see what you are all capable off I am so happy too see you all every week. Holy cow this really is all stars because these are all awesome and WAY cute! Usually you can kind of tell which one might be going out the next week but these are all great. I don't want anyone to go home. Great job! WOWZA! I love them all! I got a new favortie with each one - tough choice! OMG how do I pick just one, they are all so wonderful!!! WOW. I really am not sure who to pick this week. I think it's fun that there aren't any judges except the readers this season. Great twist! Voting for this week was just too hard! I wanted to vote for all of them! Love this competition! Good job ladies. It was a difficult decision! That was seriously hard to vote for just one! I want to wear all of these myself. Thank you so much for adding the Bloglovin' link!!! i love this so much! it's creativity fest, just like i hoped it would be! you guys are awesome. What a way to start the season!! I'm still mulling over my vote. Speaking of voting: While I typically LOVE seeing the vote count as the weekend progresses, I am tickled that you have chosen to go 'secret ballot.' In the past, seeing the results have significantly effected my vote cast - whether it was to vote for one of the ones near the bottom, or for a particular tutorial over another one. So, that said....GREAT CHANGE TO THE SYSTEM!! how can I possibly pick just 1? Amazing job ladies!! So hard to pick! They are so great I wish I could vote for my top 5! 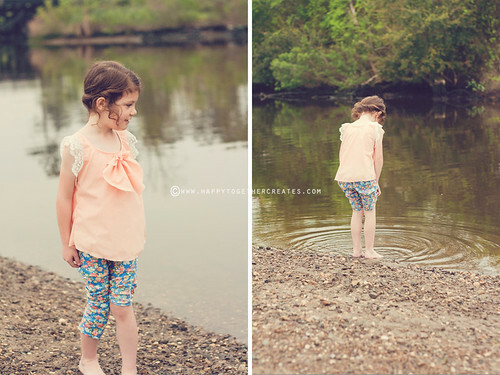 The the little peplum top! So Sweet!! Wow. What! This is beyond insane. These are so amazing, and I'm really happy that my favourite bloggy mama's didn't disappoint! (Lol as if they would. The sun shines out of their butts as far as I'm concerned). I see that these ladies aren't going to make voting easy! What an amazing collection! WOW! This was the best ever week all around! I am sew inspired!!!! Wow! How can anyone decide? Those are all amazing. Great job ladies!! !